Versatile Portable Propane Heater, heats in a 360 degree radius. Approved for emergency indoor use as well as portable outdoor use. 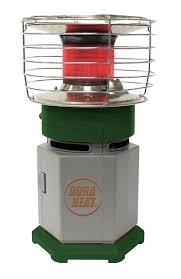 A great heat emergency item, the heater utilizes 1 Lb disposable LP (Propane ) bottles indoors and can be used outdoors with a 20-lb refillable tank. Intelligent features make the heater safe and portable such as built-in Oxygen Depletion Sensor (ODS), Safety tip-over shutoff, Protective grill guard and a simple easy to use single button lighting /heat controller. No batteries required. Lots of applications and uses. Camping, hunting, fishing, tailgating, worksites, garages and porches, patios and decks, to name a few.